Akure Monarch Batters Wife and She Calls For Help! 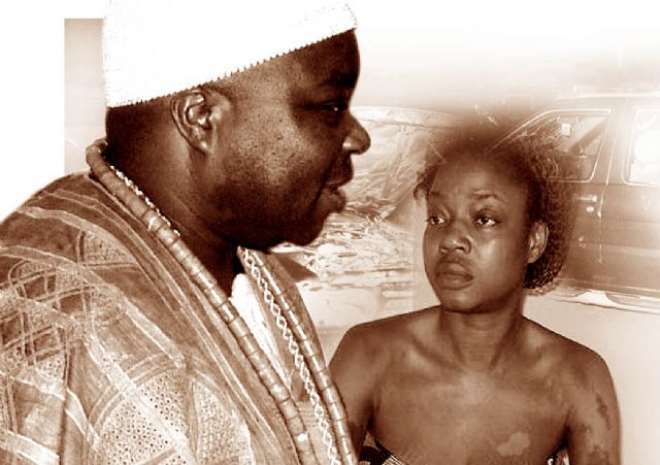 Battered wife, Olori Bolanle Adepoju of the Deji of Akureland was calling for his ex husband to be punished. The monarch had his wife Bolanle battered last Sunday. Deji barged into her apartment with the newest queen, Remi and in his presence, the co horts/thugs he came with dragged her from her apartment at her Father's house to a busy road and battered her heavily in public and he was on the verge of pouring acid all over her before passer bys intervened. She was rescued and taken to Federal Medical Centre, Owo after the first aid she got at the State Specialist Hospital, Akure. It attracted public attention and traditional kingmakers in Ondo state have been forced to summon a meeting where they discovered several other atrocities by the monarch. The monarch didn't complete the required traditional rites and he violating the custom and tradition by personally going to the market to disturb traders from performing legitimate business as well as illegal destruction of food items in the market on his visits – acting in manners desecrating his revered throne as Deji Of Akureland. Ultimate, a king is never to leave his official palace without the knowledge and agreement of the Chiefs – this is a age long and mandatory custom. The kingmakers would be deciding the fate of the king in days to come meanwhile women in Ondo state took to the streets to protest and call that the monarch be prosecuted as desired by the victimized ex wife, who is calling for help and written a petition to the Ondo state governor Olusegun Mimiko to prosecute the monarch for his criminal action.